Alan Clay's award winning new romantic comedy Courting Chaos was released in October 2014. An innocent Beverly Hills girl falls for a Venice Beach street clown named Chaos and she must overcome her inhibitions and become a clown herself for the relationship to succeed. The film won the Special Jury Award for Romantic Comedy from Worldfest in Houston, one of the top awards from the oldest independent film festival in the world, where lead actor, Rachelle DiMaria, was also nominated for Best Actor. Butterfly Crush is a story about a female song and dance duo who threaten to self-destruct on the brink of fame. The girls are up for the Australasian Song Awards, but their chance at success is jeopardized when Eva gets involved with a Kings Cross cult, the Dreamguides, and Moana must risk everything to save her. Butterfly Crush has been picked up for North American distribution. The film is distributed on TV and DVD in the US and Canada by Vanguard Cinema and in Video On Demand by Indie Rights. Best Feature Film Award - Reel Independent Film Festival, Washington D.C. The film continued its successful festival run with a screening last month at the Reel Independent Film Extravaganza in Washington D.C., where writer-director Alan Clay (pictured left) was on hand to receive the top prize of Best Feature Film. 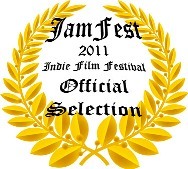 Butterfly Crush received a Silver Festival award from the 2011 Jam Fest Indie Film Festival, which is run by the Southeastern Louisiana University Department of Fine and Performing Arts. Butterfly Crush continues its string of successes in the States, winning 'Best Feature Drama' at the Indie Gathering Film Festival in Cleveland, Ohio. The Indie Gathering Film Festival exists to showcase the independent filmmaker and to inspire and encourage film makers through a competitive showcase of independent films. 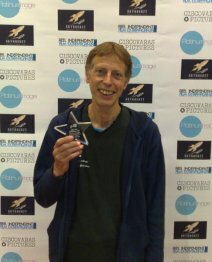 Writer-director Alan Clay is pictured with the award. 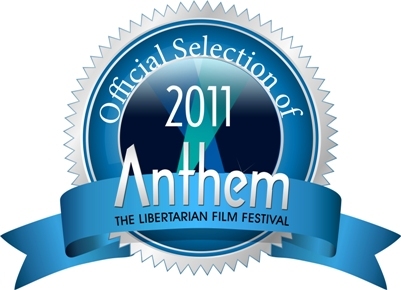 Butterfly Crush screened July 15th at the Anthem Libertarian Film Festival in Las Vegas (USA) where it won the Best International Narrative Feature award. The festival presents the year's best films about personal and civil liberty and Butterfly Crush was programmed, "because the theme of choice and accountability in the film is particularly strong". Butterfly Crush has received an Accolade Award of Merit for a feature film. And Amelia Shankley received an Award of Excellence for Best Supporting Actress in the role of the Dreamguides cult leader, Star. Based in California, the Accolade is unique. Awards go to those filmmakers who produce fresh, standout entertainment and recognize producers, established and emerging, who demonstrate exceptional achievement in craft and creativity. Butterfly Crush was also well received at the Ventura Film Festival in mid-July, where writer-director Alan Clay and Art Director Stewart Fulljames participated in lively Q&A after the screening. The film also screened at the Love Unlimited Festival in Portland, Oregon, where it won the 'Best Makeup in a Feature Film' award. The movie enjoyed a theatrical release in New Zealand in August and is currently available on DVD with copies in rental stores throughout the country. See the right hand column for a comprehensive list. The DVD can be rented online from Fatso or you can buy it online through Fishpond or Native Vision. In the US the DVD of Butterfly Crush is now on sale and can be purchased for US$14.99. For those in North America, Butterfly Crush is now available as an Instant Video download from Amazon, where it can be rented (single viewing) for only US$1.99 or purchased (multiple viewings) for US$9.99. The singing duo Butterfly Crush are currently building an online fan base. Some of the recent podcasts are posted below and you can check out the podcasts and music videos which already have over 8000 fans, friends and subscribers on YouTube, MySpace, Bebo and FaceBook. You can find the latest news on the Sydney release of the movie or check out the New Zealand release page on Facebook. The duo are getting comments like, “aww yall are hella cute!! !” , “I love it﻿”, “great job girls! PRO!”, “excellent well done 5 star”, “great work”. 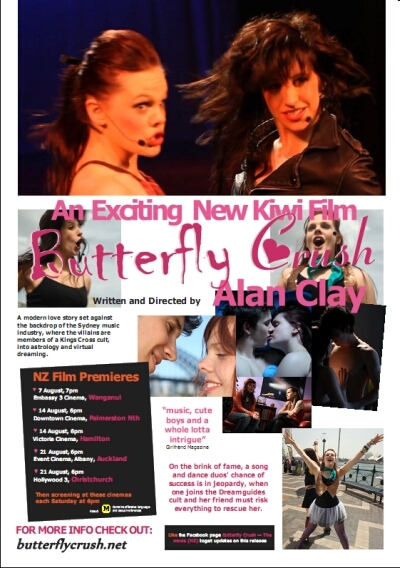 Check out the 'Butterfly Crush the Movie NZ Release' page on Facebook for all the information on the New Zealand DVD release. Moana and Eva are a song and dance duo which is up for the Australasian Song Awards, when one gets involved in the Dreamguides, a cult which is into astrology and virtual dreaming. On the brink of fame, with their chance of success in jeopardy, Moana must risk everything to rescue Eva and keep Butterfly Crush in the Awards. Will Moana be lured into the cult by a young member, Matt or will she break free to follow their dreams? On this site you can check out news items and press releases, production credits and photos, find an outline of the story plus photos, read reviews of the book, watch the trailer and view podcasts from Butterfly Crush. The Butterfly Crush DVD can now be rented online from Fatso. Or you can buy it online through Fishpond or Native Vision. Rated M - Contains offensive language and sexual references. If you would like the film to screen in your city, you can "Demand It!" using the widget below. You can find information on auditions for roles in our movie in development True Believers and checkout reviews of the novel on which it is based. You can also find information on our next film project, Angels Can Fly, and read an excerpt from the book. On this site you can also check out Artmedia's digital short film, Moontan which was released in 2007 - read the synopsis, check out reviews of the book on which the film is based, or read scene one of the script, and find information on the cast and production team. Building a community of interest in contemporary Australian and New Zealand literary and Performing Arts - Click on this link to find other similar sites.